Happy Friday Friends!! 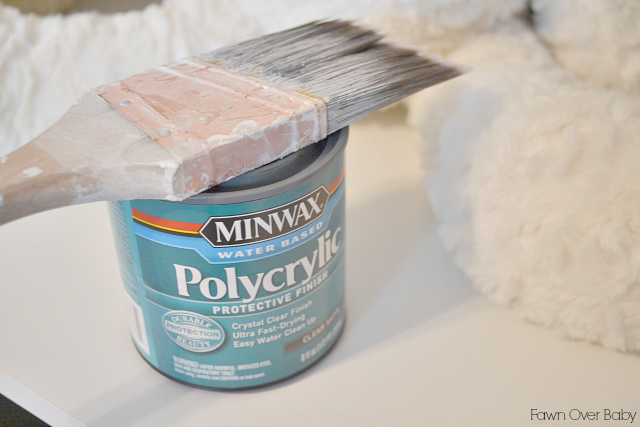 I am so excited to share another fun weekend project for your DIY pleasure! 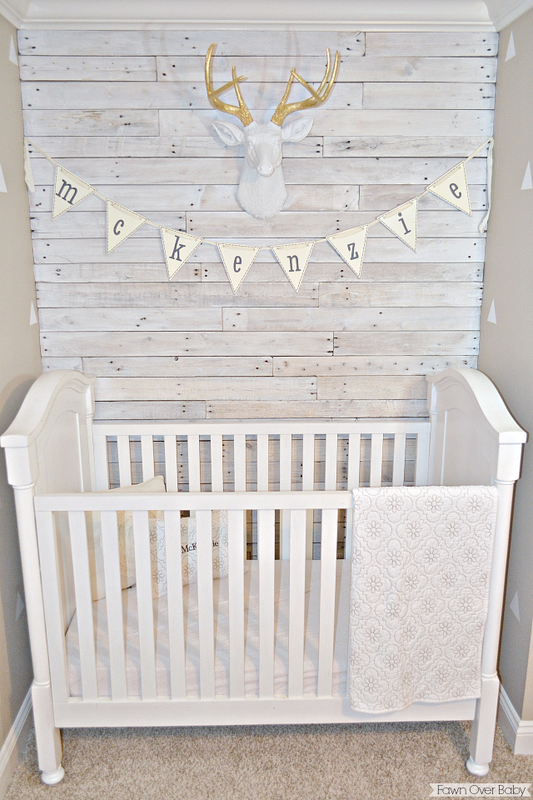 This past Monday, I revealed McKenzie's Nursery in our new home with lots and lots of DIY decor. 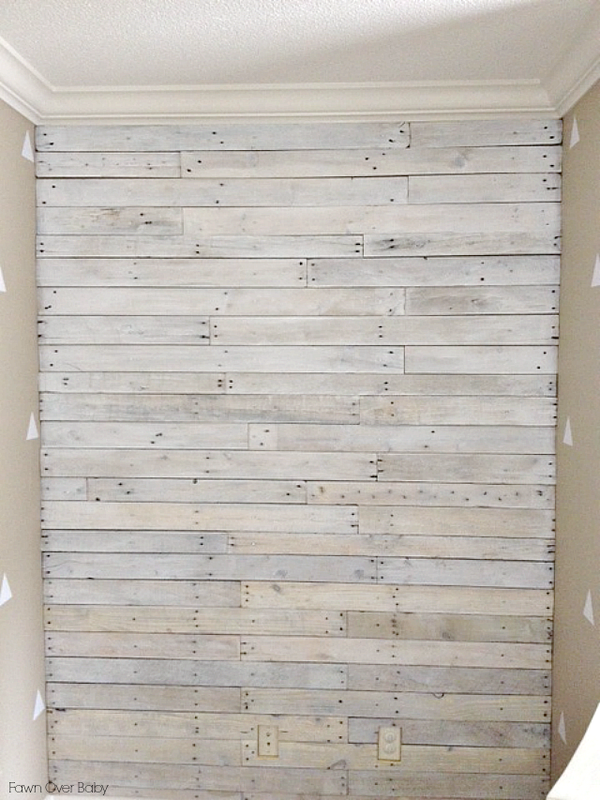 I received many comments and inquiries on how we made our pallet accent wall, I decided to go ahead and share it with you today. If you follow me on Instagram, you may have seen this wall loooong before I posted our big nursery reveal. Thank you to my wonderful Fawn readers for patiently waiting on this exciting "How-To". With the help from Owen's Olivia Blog, I was able to follow her step by step instructions to successfully achieve the wall of my dreams for my daughter's room. I have to say, it wasn't as back breaking as I thought it would be. Well, maybe that's because I enlisted my husband to do all the muscle work. With that said, I'm pretty confident that if I was left to my own devices, I think I could pull it off no problem (I think). Well, let's get to it!! 5-8 Pallets: maybe more, depending on your wall size. Our dimensions are 66inch wide X 84inch tall - we used 5 pallets. 1. First, Clean Your Pallets! You can rent a pressure washer at your local hardware store for around $60 per day. We went ahead and bought one at Lowes for $99. 3. After we my husband dis-assembled the pallets, I went back through and power washed the areas that were nailed to the base, as the pressure washer was unable to get to them (you can see the outline of the areas below). 4. Optional - I painted a sealer onto the back of the boards (the side that would be going against the wall) just to add a little barrier. 6. Then attach boards to your stud/wall using 2 inch screws and a cordless drill. 7. 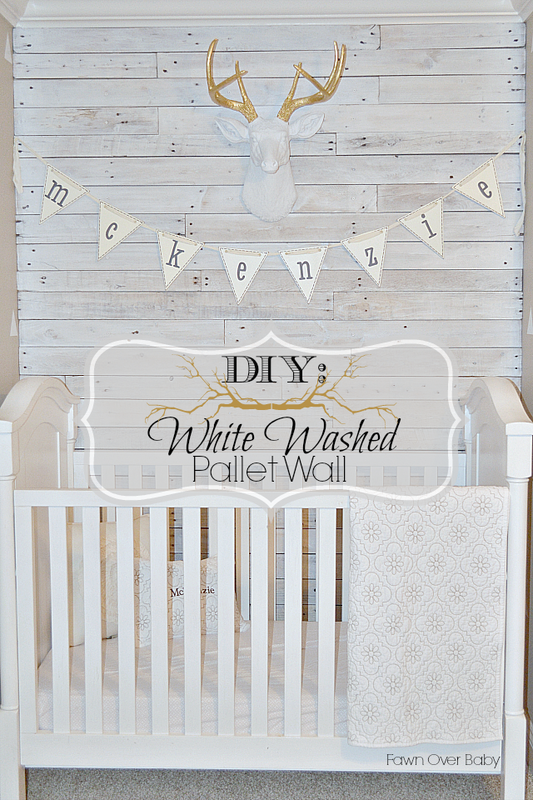 If you are blessed with a handy helper, while your pallet boards are going up, mix your white wash paint mixture. Mix 1 Part Paint X 2 Parts Water. 8. 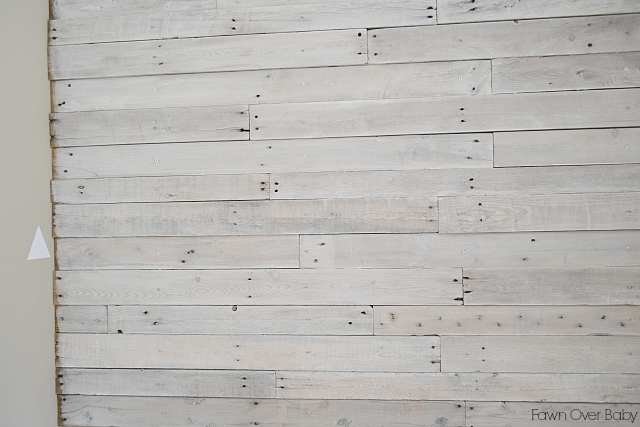 Paint your white wash mixture onto boards after they are all attached. I started off using a staining cloth to apply, then switched over to a paint brush and it worked just as well. **Depending on how much wood you want to show through, you may want to apply several coats or just use less water. I wanted mostly white with a little wood grain showing through, so I used 3-4 coats. In the photos below you can see the little bit of difference a few more coats make. 9. After paint dried, I used sand paper to give it a bit more of a worn look and to sand away any splinter hazards. 10. After sanding, I applied water based Polycrylic to seal the paint and give the boards a smoother finish. Let it dry and YOUR ALL DONE!!! 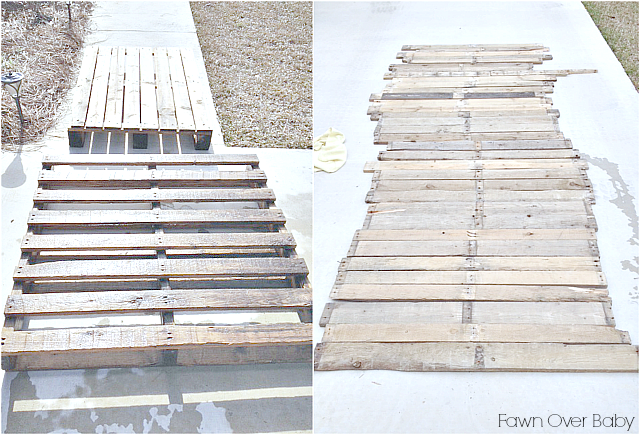 I hope you enjoyed this How-To and I can't wait to see your Pallet Wall Come To Life! 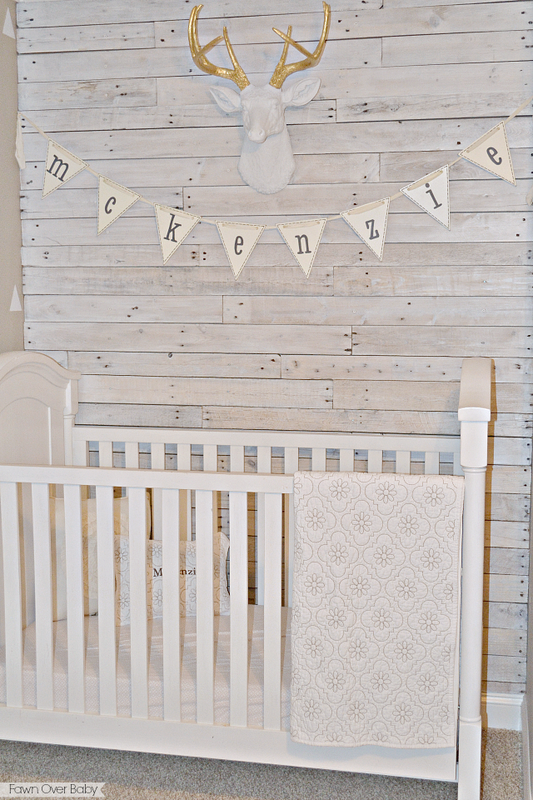 Feel free to email me your rustic wall charmer at fawnoverbaby @ gmail.com or leave a comment below letting me know how your pallet wall journey is going!! What is the paint color for the other walls called? I love it! Would you be able to download the app "Colorsnap" by Sherwin-Williams? It would allow you to take a picture of the wall and the. Tell you the color name and paint code. We love the color and it would be a big help.